We need your help! This is a free community resource: Please give us any feedback you deem appropriate. If you like it as is, we’d love to know. If you don’t like it, we’d love to know how to improve it. If you find typos or errors, please let us know! Your fellow students will all benefit from your feedback. For the previous two parts of these objectives go to Part 1 and/or Part 2. Traffic shaping is a technique used on high volume networks to ensure the timely delivery of prioritized traffic and provide optimal performance to the users. The network is managed and optimized to control the type and amount of traffic by prioritizing important traffic. As an example, VoIP traffic will receive a higher priority than standard data. Quality of Service (QoS) is a group of techniques that ensure that voice and video communications are handled in a time-sensitive manner. This will avoid jittery VoIP or choppy video streams. Prioritized traffic is given all of the network bandwidth it needs. We’ll look at two of the standard techniques used for QoS next. Differentiated Services (DiffServ) works at OSI Layer 3 to examine all traffic and prioritize time-sensitive packets like voice and video. DiffServ modifies the DiffServ field in an IPv4 packet or the Traffic Class field in an IPv6 packet. This information tells routers how to handle the packets. Class of Service (CoS) is another QoS method that operates at OSI Layer 2. CoS improves the routing and switching of Ethernet frames between VLANs. Tagged frames are prioritized using eight priority levels (0 – 7). The level is assigned to the frame in a three-bit field in the header. The field is called the Priority Code Point (PCP). Network Address Translation (NAT) was designed to reduce the need for public IP addresses required by a network. A gateway provides separation between a private network and the public network by assigning private IP addresses to its network. Only one Public IP address is used and the private network is invisible to outsiders. The private devices use the gateway to communicate with the Internet or other networks. The gateway translates the private address to the gateways public address. This is great for outbound sessions but presents a problem with inbound sessions since they are returned to the public address and do not contain the NAT information. This is where Port Address Translation (PAT) comes in. Each session between a local host and an Internet host is assigned to an individual TCP port. When the gateway receives traffic intended for the host it knows where to send it. 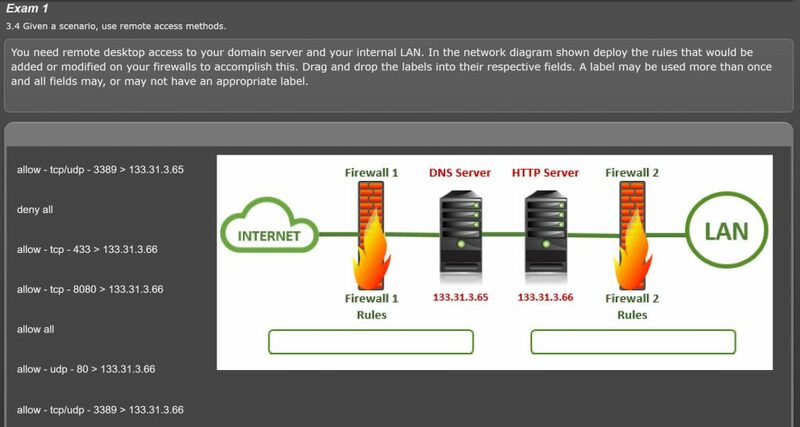 Port Forwarding redirects traffic to a port other than its default. For example, FTP uses insecure port 21. With port forwarding you can use a different, possibly secure, port to disguise the traffic. This is a feature of NAT and needs to be configured on the gateway. An external host must know the address and port number to communicate. Since a router examines all packets, it can drop any packets that are not permitted by the ACL. The ACL will compare the traffic to its ordered list of permit/deny rules. Each rule will either deny the packet or pass it to the next rule repeating the process. Only packets that are permitted by all rules will be allowed onto the network. In the virtual environment distributed switching provides a centralized control point for VMs and virtual server clusters across multiple points. This simplifies network management and reduces errors. On each physical host an agent is installed. A supervisor module on the distributed switch then controls the hosts. Since switching determines how devices communicate on a network we will look at two major switching methods. Circuit-switched networks are easy to relate to. Compare this type of switching to that of a telephone call. The first party attempts to connect, the second party accepts the connection establishing a circuit. All data on the circuit will use the same path. This circuit will be used only by the two parties and will remain connected until one of the parties disconnects. This is simple and direct. Packet-switched networking is by far more efficient and adaptable to IP networks. IP protocols break the data into packets before transmission. Since each packet contains the necessary addressing information and sequencing, each packet is free to take the fastest route to its destination. The packets can arrive at the destination in any order. The destination node will use the control information in each packet to reconstruct the transmission. This method uses considerably fewer network resources than the circuit switched alternative. With our networking environment consisting of both virtual and physical networks management and even creation of new networks represents quite a challenge. SDN (software-defined networking) centralizes the control of data flow by using software. In this process determinations that were traditionally handled by routers and switches, are now handled by the SDN controller. The SDN controller integrates the functions of device configuration and device management into a single software interface. This simplifies device management as every physical or virtual device can be accessed, monitored and configured. The software interface or dashboard allows administrators to control devices simultaneously as a group, making it a clear alternative to individual device access. SDN will play a major role in Cloud technologies. And this concludes our three-part post for CompTIA Network+ N10-007 Sub-objective 1.3. For the previous two parts of these objectives click on Part 1 and/or Part 2. Hi my name is Nikita. I’m a student currently studying for the N10-007 so I’m reviewing many credible sites to study for the exam. There is some confusion from me about that definition. From 2 separate sources including Cisco and a professor with 20 years knowledge, I have learned that most ACLs actually allow traffic if it matches a single allow rule. It doesn’t have to go through the whole list to be allowed. Or it can be denied by a single deny rule. If the traffic reaches the end of the whole list of rules, most ACLs will have an implicit deny rule. So even if no specific rule denied it if no rule approved it either, the packet will still be dropped. My question is this: Is your definition of ACL one of many possible ACL types and both definitions of ACL correct? If it is, Can i know your source? Thanks for the help. I like the material so far. Hi Nikita, thank you for your note. Our author is out for the week of 4th of July but will respond to your question when he is back in next week.